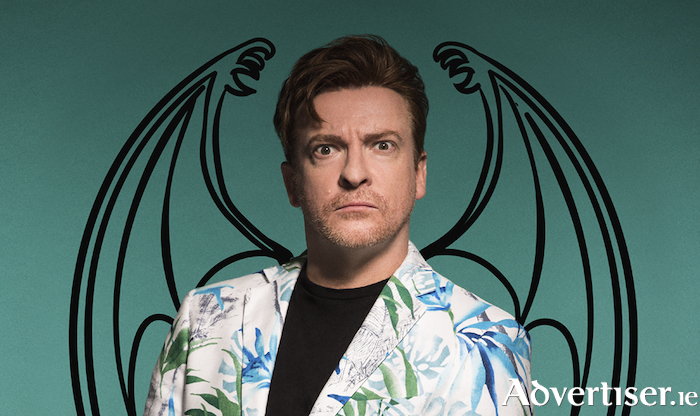 GALWAY AUDIENCES have a chance to become part of comedy history as Flight of the Conchords star, Rhys Darby, is shooting his live comedy special in the Town Hall Theatre this October. The New Zealand born actor, writer, musician, and stand-up comedian is best known as Murray, the inept, but well-meaning band manager in Flight Of The Conchords, and since that ground breaking show, he has gone on to star in films like Yes Man, Jumanji, The Boat That Rocked, and Hunt For The Wilderpeople. An ex-soldier in the New Zealand Army and a veteran of 20 years of stand-up, Darby has performed his sensational blend of sound effects, characterisations, and askew observations, in Iceland, the Falkland Islands, at the Edinburgh Fringe, and at Montreal’s Just for Laughs. Rhys is coming to the Vodafone Comedy Carnival Galway to record his latest stand-up special, Mystic Time Bird. In the show, he turns to the world of ancient mysticism to find answers to the world’s problems. In doing so, Rhys discovers he was a bird in a past life, and this knowledge takes him on an unexpected path. Cue questions like “Are we truly free in this day and age or is alien technology guiding us to an even greater cage?” along with weird movements and sound effects. Page generated in 0.0786 seconds.